What a weekend Supersonic Festival 2014 “Ltd Edt” was! At Capsule HQ we are all still buzzing from the incredible reviews, kind feedback, fun photos and wicked, wicked memories (Oh, Sly!). Thank you our loyal & lovely audience for the big part you played in making the weekend such a success! We have a selection of Supersonic treats from our online shop to help you through the slump. There are T-shirts, live recordings on heavyweight vinyl and all sorts of other bits & bobs. Check out all our goodies HERE. 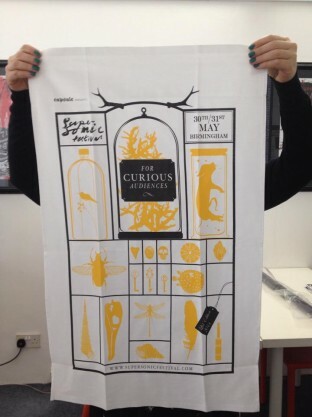 Especially designed by David Hand for this year’s festival, we have a super limited edition tea towel ‘For Curious Audiences’, pic above. It’s so lovely we’ve had people tell us they can’t bear to actually use them. Instead people are opting to hang them up… whatever makes you happy is fine by us! If you are more of an out and about type, then you may prefer to grab one of our rad tote bags. With an orange this bright you can’t fail to get noticed for all the right reasons! It’s always a proud moment when we see someone supporting us in a tee or looking sharp carrying one of our tote bags! So thank you in advance for supporting what we do. For these items and more visit our shop!